I minored in Illustration at Uni'. 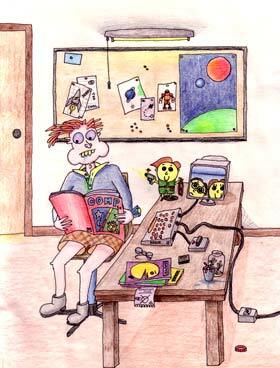 But even before that I'd had one or two opportunities to apply my drawing skills to a written narrative. When I returned to school (in 1992-ish), one of the fun projects in English class was to create a children's story book. I came up with the story of a nerdy kid who visits a fantasy world "inside" his computer, sort of like Tron but more innocent, with less CGI. Unlike Tron there probably wont be a sequel. 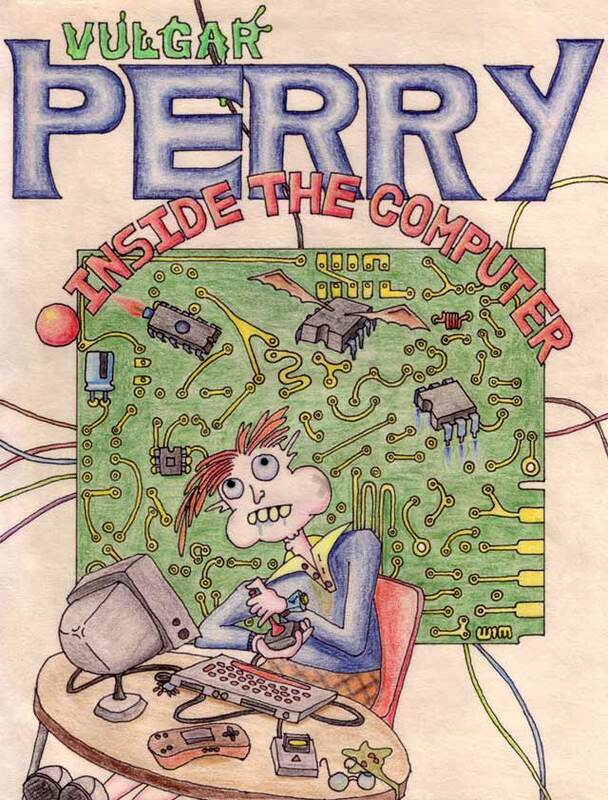 I dug Perry out for a look recently, the drawings stand up to time well enough but the writing needs work. In any case, it was a fun exercise creating interesting scenes and characters that attempt to enhance the enjoyment of the story. Why he's called Vulgar Perry, is a story for another day. Vulgar Perry - Inside the Computer. I got a contract to provide 10 full-page illustrations for a children's book, "Chesscapades" a fun story inspired by the chess board in Fremantle square. This was a nice diversion from the 3D concepts I'd been working on in recent years. I studied illustration, graphic design and animation at Uni', here was an opportunity to exercise my 2D grey cells. I designed and illustrated all the characters for Chesscapades. The authors wanted something clearly recognizable as chess pieces and visually simple yet they had to ooze character and be likable. I think I fulfilled the brief for the most part, they don't look like dull, stiff chess pieces anymore and possess an energy that couldn't be achieved with something more literal. It was a lot of fun working on these characters, endowing them with individual personalities and life. I especially like some of the Pawns. After more than a decade working with 3D and 2D design, I'd like to think I'm starting to get my head around this Design thing. I think the enjoyment of creating something is the same whether it's 2D or 3D. For me, discovering a novel, elegant or clever solution to a problem is the most rewarding aspect of the design process. The fun is in turning an idea into something real that people can experience, enjoy and (maybe) be surprised and impressed by. A really good design might even make them think differently. Blimey! Web design definitely exercises the 2D brain cells yet I still have a strong urge to make things with my mits. My interest has recently expanded beyond product design, to include prop design and various geeky pursuits. Designing and building props, sets and costumes is great fun. The imagination is free to do maximum imagin-ate-ing, and you get a cool object you can hold in your hand. If the prop happens to be science fiction or fantasy based, even better! I definitely hope do more prop building shenanigans.